It's amazing how quickly life returns to its crazy schedule; with late nights every day this week in school meetings, soccer practices and so forth; we only finish our sit down family dinner after 8:30pm! Our evening meal is the one where we connect with each other, talk about the highs and lows of the day and anything else one of us wants to share. It's a long wait to eat at 7:30ish, and even though some members can eat whilst others are busy, nobody really wants to eat by themselves. So we do the communal meal every night. It has become such an important part of our day as a family and helps keep that special family bond active. 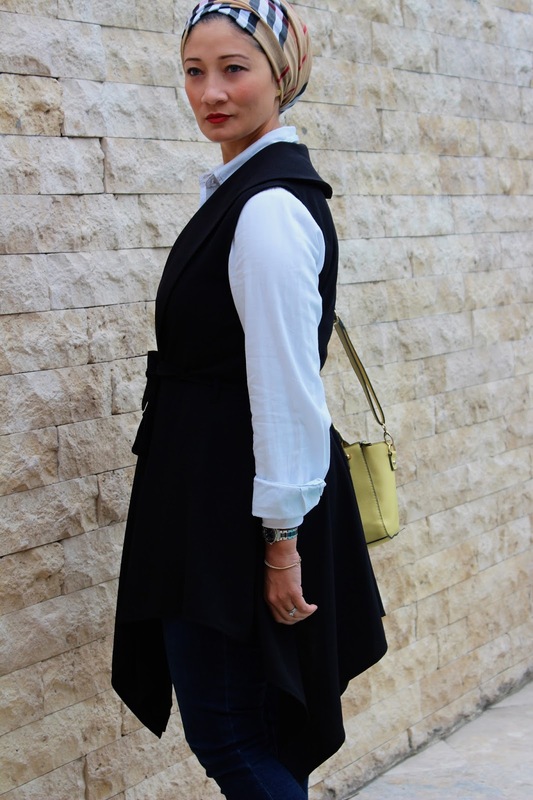 With things being as insane as they are, I have not had the chance to share my discovery of a new boutique, Few and Far Collections, a online boutique which specialises in fashionable modest wear. It caters for a "Woman of Substance" ie "one of substantial or solid character or quality." Now, for anyone following the European Hijabis, this store stocks those classic pieces that can be dressed up or down and is frequently styled by the likes of the popular Hijabi Instagrammers and bloggers. The collections include some really conservative pieces, and since I'm not generally conservative in my style, I embrace the challenge to add that edge to a classic piece. 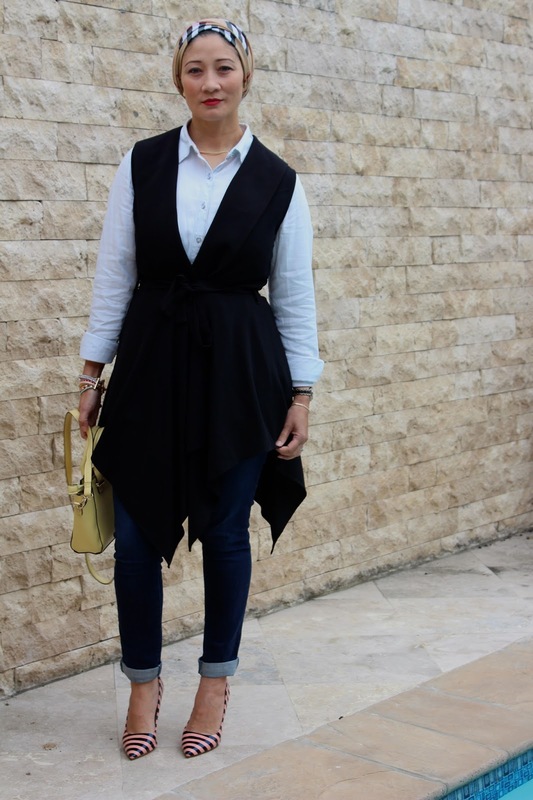 In today's look I am wearing the Sleeveless Asymmetrical Coat, paired with full denim and cheeky heels. The quality of the pieces are impeccable, and the pricing is reasonable, especially if one considers the fact that they won't date easily. And anyone who has been reading my blog for a while will know that I advocate buying quality classic pieces (investment items) more commonly known as smart shopping. It means buying less, buying good quality and versatile pieces. Feel free to check out Few and Far collections, and you can even visit the showroom if you'd prefer to fit the item first. This may be advisable as their sizes are European based and therefore don't conform to our standard sizing. Happy shopping and don't forget to checkout the website here. The site is updated constantly with new stock, so keep an eye on it!